If you find yourself in need of a driver for a high power string of LEDs this is a must read. [Limpkin] just designed this driver as a contract job. He can’t show us the schematic, but he did share some tips on how to build an LED driver around a MAX16834 chip. As you move to higher power designs the barriers to success pile up rather quickly. Using a chip like the MAX16834 really helps to simplify the task as it can be used as a boost or buck converter, it includes functionality that allows for dimming, and it’s a constant currents solution. There are board design issues that need to be accounted for in these designs. [Limkin] included links to a few calculators that will help you determine trace width based power levels used with the driver. He also recommends using copper pours on both sides of the board connected with vias to help dissipate heat. To that end he used an IR thermometer for feedback during testing. It’s too bad he doesn’t have any photos of the device at work. If you build something similar please take some pictures and tip us off about it. Given that he posted the solder masks, pictures of the populated board, pictures of the depopulated board, the reference designs he based it from, and a lot of the design philosophies he based it from, it really shouldn’t be too hard to reverse engineer this. Honestly, the key would be to make a circuit that is easily modifiable to the current/voltage load of the string of LEDs in question, so that it would be a cinch for a hobbyist to take the design and use it in their own projects. In designs like this the component value and tuning are very critical. Even the LED forward voltage can bring the converter out of balance, because it has operate at a different duty cycle. This means a capacitor or inductor could drop below the minimal value. So for optimum results you have to recalculate these values for your specific LED. This basically means designing your own converter because the calculation and tuning is most of the work. However, I’ve designed a buck-boost 60W driver with a MAX16833. It wasn’t straight forward, even contacting Maxim still had much trouble resolving stability issues. The weirdest thing of all; after multiple FA engineers looking at it I had 3 different(!) formula sheets. None of them worked, the driver either dimmed the output or started oscillating/blinking like crazy. Between the article and Hans’ comment, I think this better demonstrates how NOT to design your own driver – at least if you’re a hobbyist. The heart of this is a constant current boost converter. However, instead of simply adjusting the current to dim the LED, the current remains fixed; dimming is achieved separately via an additional PWM switch. While this may have some minor efficiency advantages, it also means the converter has to maintain current regulation while dealing with a discontinuous load, in which the current frequently drops to zero. This is tricky, adds complexity, and it’s no wonder it’s so unstable and has to be tuned so carefully and to work with a very specific LED. When three Maxim engineers can’t even give you a working circuit, there’s your sign you’ve gotten too darn fancy. Better for a casual designer to do away with such excessive fanciness, and dim the most straightforward way; by adjusting the current. 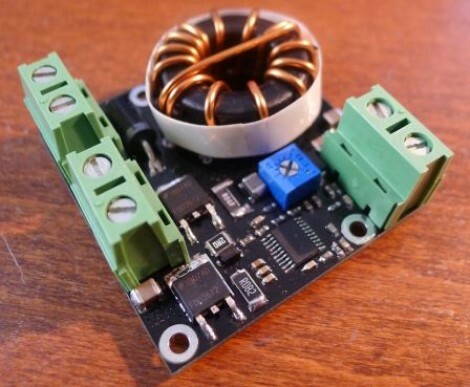 A constant current boost converter like the MIC3230 series (just to pick a random example) would be a better choice if you don’t want to pull out your own hair. The output was typically about 47V to 50V or so. The biggest issue was the compensation networks and the current control loop. When drawing more current it went unstable and the converter went into panicky mode. After fiddling (increasing/decreasing and seeing what effect it had..) with some caps in the compensation I did get it to work at 95% or so, but was still very unstable (like jumps 10% to 50% was also fatal, slowly increasing 5% at a time was fine). All external components were good for up to 20A or so, and we were only doing 3A to 8A. I knew the chip wouldn’t going to be easy, so I literally took the evaluation board schematics and upgraded the components to my specifications. In the end the LED we were using proved not usable in our optics and went back to a previous design with National Semi parts. Those worked out of the box. I’m thinking perhaps you’re trying to modulate LED brightness faster than the human eye can see, for long-range communications purposes. In that case, the current control loop and output LC circuit would be quite slow, and trying to improve speed would soon lead to instability. Hard to say without knowing for sure, and I know you can’t spill the beans. But I still think that for general LED lighting, there’s simpler solutions that are fast and stable enough. Design Maxim anything in, and in 6 months, you won’t be able to get the part. Maxim is notorious for this. I was designing something similar at my local hackerspace as a arduino shield. However instead of using controller chips, it was just mosfets and stuff, so that you can directly PWM the LEDs from the arduino code. Mathias Brüssel wrote a comment on project log Metamorphosis + Audio Sample. Meg Richards liked pcbtc (GaN edition). Joe Perch liked Big 7 segment display.